SHANNON McFerran may not be a household name, but the English and physical education teacher at Kealba Secondary College is a legend in her own right on the football field. And that's Australian football, not soccer, as McFerran has had to point out. "Some people don't know women's football exists. If I say I play football, they say soccer right away," she says. Despite such obstacles, the 28-year-old Melbournian has built an illustrious footy career. And although she loves teaching, football is McFerran's consuming passion. The St Albans Spurs captain won her fifth Helen Lambert medal (the equivalent of the AFL men's Brownlow) last year for the Victorian Women's Football League, is vice captain of the state team and has represented Australia in a women's international rules match tour in Ireland. Her brother Daniel, a teacher at Keilor Downs Secondary College who McFerran says inspired her to play, also won a best and fairest medal last year in the Northern Football League. McFerran made history last July as one of two women chosen to play in the EJ Whitten Legends match at the Telstra Dome. There, McFerran earned the respect of the sport's greats and had a few laughs with comedian Strauchanie, who she lined up against. "The guys I was playing with were people I've watched and kind of idolised or despised, if they played for another team," she says, laughing. "They were really fantastic. They were all so supportive. They got the other girl [Daisy Pearce] and I really involved in the game." Women's footy has come a long way since McFerran was a teen. While she had to stop playing competitively with boys at age 12, girls now have the chance to play against each other. 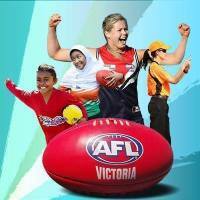 McFerran is confident that one day women will be paid to play professional footy. "It's so well accepted now. The opportunity is there if girls want to participate in the sport. With all the pathways now, the skill level of girls coming up is really good."